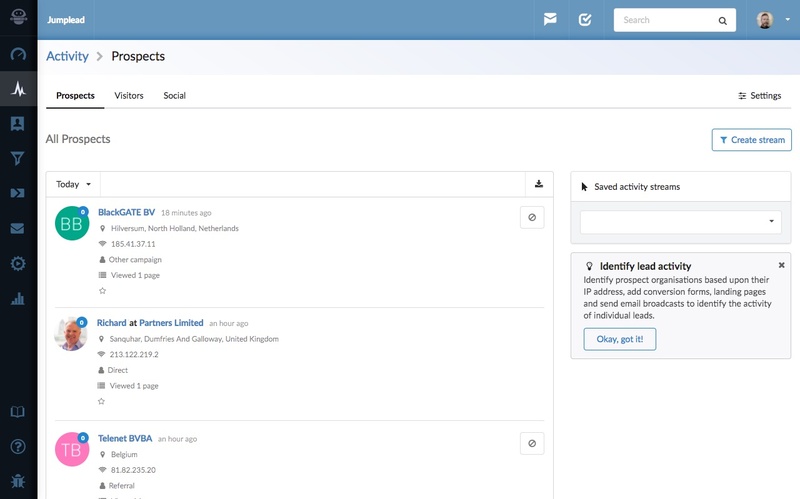 The Activity section gives you the ability to see what’s happening on your website right now, identifying returning contacts and the pages they are viewing so that you can see who is currently engaged and giving you the opportunity to reach out at the right time. Setting up Activity Streams within the Activity section will allow you to add an automation to send you notifications when your contacts return, or even view certain pages. Jumplead allows you identify the contacts and organisations that visit your website along with the pages they have visited and where available the search terms they used to find you. This information can be particularly useful for business to business (B2B) companies as you can identify companies that are potentially researching a purchase.